The AEMO summary tells us that the multiple will be about 2. (Table 4 indicates 2.3 and Fig. shows it to be 2.6.) However all such pronouncements count for nothing unless we can see the long term weather data and assumptions they are based on. This is not made available in the Elliston, Diesendlorf and MacGill or the Hart and Jacobson cases. AEMO says the reliability standard assumed is capacity to meet demand 99.998% of the time, and they refer to plant needed to meet demand in ‘a typical year’. (p.8). This sounds quite impressive, but we would need to see the climate data showing that this would have been achievable given the actual wind and solar patterns over say the past ten years. In other words, much more important than a reliability figure referring to a typical year or many years is how often weather patterns would result in little or no solar plus wind generation, for how long each time. Before we should be impressed by any claim for high penetration renewable supply we should ask for an explanation of how it would get through the worst ‘big gap’ events in the weather record for the region. An impressive reliability figure of 99.9% could be made up of 8751 hours in a year when sun and wind could meet demand, and 9 hours in a row when they provided no power at all. The big gap problem is briefly recognised but the report then implies that it has been dealt with by presentation of a supply ‘bundling’ for what is labelled the ‘most challenging week’. (Fig. 23, p. 45.) This is not credible since the week represented is one in which there are more or less average solar and wind energy resources every day. The above BOM evidence shows that there will be sequences of several consecutive days in which sun and wind resources are negligible or zero despite wide spread of collection sites across the eastern half of Australia. To maintain supply through these events would obviously require far more back-up capacity than this study claims. There would ;probably be a need for sufficient biomass-electricity generating capacity to meet almost all demand apart from hydro and geothermal. This report reduces the scale of the problem via two questionable assumptions. The first is by assuming demand shifting. This cuts about 10% of daily peaks by moving some demand to later in the day. We’d need to be convinced that this can be done. The second is by assuming a large geothermal contribution. In Scenario 1 this is 30%. (Fig. 12, p.38.) This source is important because it does not suffer from intermittency and therefore reduces the proportion of demand that does and that therefore requires a large amount of back-up. However, for all we know the geothermal contribution will turn out to be zero, given the recent history of failure to make progress apparently despite the write off of several hundred million dollars. These considerations indicate that much more than twice as much plant as would meet average demand would be needed, and that AEMOs capital cost estimates are therefore likely to be much too low for this reason, as well as others. (See below.). No discussion of embodied energy costs. It is only very recently that attention has been given to what should be included in the calculation of these costs. For instance should the energy cost of building the factory that produced the aluminium for the frames be included? These issues are far from clear and settled but it is very likely that when they are EROIs for renewables will be considerably worse than is currently assumed. For instance Palmer’s (2012) recent study of PV in Melbourne, attempting to take in all relevant factors, arrives at an EROI of only 2.1 – 2.3. I am not aware of anything like a satisfactory study of solar thermal EROI but I expect that all inclusive estimates will result in values well under the 10 – 20 assumed today will be arrived at. It was emphasised above that high penetration renewable systems must have a lot of redundant plant. I suspect that a properly calculated back-up multiple the AEMO plan will involve a capacity multiple around 4, similar to that of Hart and Jacobson. In other words whereas 52 coal fired power stations would meet the average (scenario 2) demand, they will probably need around 200 GW of wind plus PV plus solar thermal plus biomass-gas-electrical generating capacity, when all energy costs and losses are taken into account. If the percentage of lifetime output of this plant has to go into producing the plant is as low as 10% this means the embodied energy cost/loss corresponds to the output of 20 power stations — meaning that if we want a net 200 GW capacity we will have to build 220 GW of capacity. (And according to AEMO the solar thermal, geothermal, wave, and biomass components will be more costly than coal-fired plant in the long term future.) So from back-up and embodied energy considerations alone it seems that the report’s conclusions about the amount of excess capacity, and that total system capital cost, might be less than half the actual figures. It is said that 5% loss in transmission has been assumed. This seems somewhat low for PV and solar thermal located in the best regions. The estimated future capital cost figures for various renewable technologies in Table 3 seem to be in order, coming from AETA, except for the assumption that storage would add only 23% to solar thermal plant cost. It is stated that 9 hour storage has been assumed. There is a footnote reference to the fact that storage requires a higher solar multiple. However Fig. 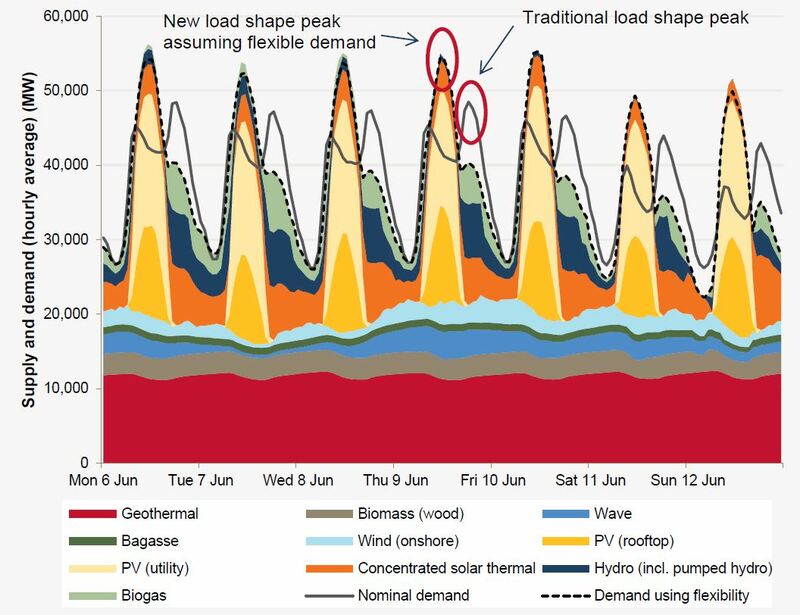 2 seems to show that solar thermal storage is going to supply right through the night, meaning that storage might have to approach 18 hours and the solar multiple would have to be approaching 4. Lovegrove, et al., (2012) indicate that this would more or less double the commonly stated capital cost, which assumes 6 hour storage. This does not seem to have been taken into account re costing. The capital cost conclusions, up to $332 billion, assumes 2030 or 2050 construction costs, which they give as less than one-third present PV costs and about half present solar thermal costs. The typically overlooked crucial point about thefuture capital costs these kinds of proposals use is that they won’t apply for decades, so if we are to move enthusiastically into building renewable plant in the early years we will have to pay two to three times (for PV) these costs for major components of the system, and go on doing so for a long time. Fig 16 shows 47 GW of PV capacity. If the assumed present cost, as distinct from the assumed 2050 cost is assumed, we would have to add $3 billion p.a. to the total system capital cost in the initial years, increasing it by one-third. Similarly the 18 GW of solar thermal capacity would add almost as much. Those two factors increase total system capital cost to over $500 billion. They do stress that the total capital cost would be more than the $332 billion figure given, in view of omitted items. Following is their list of items to be added, plus two I have discussed above. Proper/convincing demonstration of provision of adequate back-up for big gap events. Supply to Northern Territory and Western Australia. The cost of the possibly 5000 square km (!) of land that might need to be acquired. Losses in distribution (as distinct from long distance transmission). The cost of ‘stranded assets’, i. e., plant that is to be scrapped as the new plant is built. In addition there would be O&M costs, which are discussed, but it should be made clear that adding these would make the cost of the new system greater than the capital cost sum discussed. Here is a point which leaves me confused about how realistic the capital cost sums given are. Fig. 3 shows solar thermal’s present cost at $10,215/kW of peak capacity today. Fig. 7 shows it contributing c. 75 TWh/y in Scenario 2. NREL’s Blythe Riverside example says a 100 MW(p) plant costing $(US)658 million will generate (not deliver at distance net of embodied and transmission losses) 358 million kWh per year (at a 5.2 kWh/m2/day site, a bit less than ideal). Therefore to deliver 75 TWh/y we would need 205 of them, and the cost would be $135 billion. But Table 3 says the present Australian cost would be $10,125/kW, which is more than 1.5 times that of the SAM example. 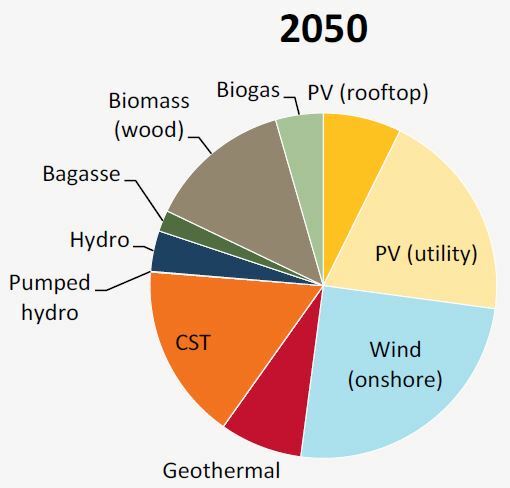 Thus the Australian near future cost for the solar thermal sector might be in the region of $200 billion — to deliver about one seventh of the power needed (for 2050 Scenario 2, Fig. 13, p.39), thus under 3% of total energy needed. The AEMO report falls a long way short of showing that 100% electricity supply is achievable. Especially important are a) No explanation has been given that sufficient back-up has been provided to deal with big gaps in the solar and wind resource, and there are good reasons to believe that the provision is quite inadequate (e.g., in Fig. 23), b) Embodied energy costs do not seem to have been taken into account, and c) There are several major cost factors that have not been included in the sum stated. The issue is not whether it is technically possible to run entirely on renewables; the issue is that we couldn’t afford to do it. Remember again that in addition there is the question of how renewables might provide the remaining c. 80% of energy required in non-electrical form, and what that might cost. Birol, F., (2003), World energy investment outlook to 2030, IEA, Exploration and Production: The Oil & Gas Review, Volume 2. Elliston B., M. Diesendorf and I. MacGill, (2012). 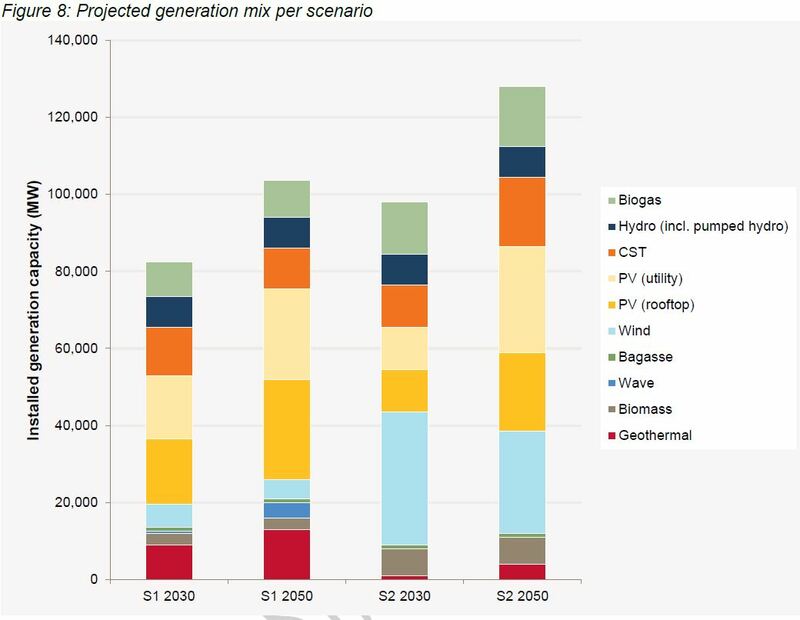 Simulations of scenarios with 100% renewable electricity in the Australian National Electricity Market, Energy Policy, 45, 606 – 613. Hart, E. K., and M. Z. Jacobson, (2011). A Monte Carlo approach to generator portfolio planning and carbon emissions assessments of systems with large penetrations of variable renewable, Renewable Energy, 36, 2278 – 2286. Lovegrove, K., M. Watt, R. Passy, G. Pollock, J. Wyder, and J. Dowse,( 2012). Realising the Potential of Solar Power in Australia. IT Power, for the Australian Solar Institute. Trainer, T., (2013b), Can the world run on renewable energy? An improved negative case, Humanomics, 29, 2, pp. 88 -104.